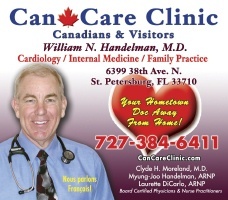 CanCare Clinic for Canadians and Visitors strives to provide quality Healthcare for Canadians and Travelers visiting or wintering in the Tampa Bay and St. Petersburg, Florida area. 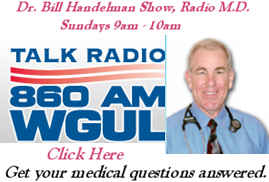 We want to be your hometown physician while away from home. Healthcare while you are in the United States should not be a dilemma. Our Florida Healthcare Clinic is here to meet your needs and provide you with the high-quality Healthcare you customarily received in Canada. We want your stay in Florida and in the United States to be pleasant, comfortable, healthy and worry free. We welcome back our Canadian cousins, snowbirds and Travelers from all ports of call to the United States and sunny Florida. We are delighted to see your return to the Sunshine State and appreciate the confidence you have shown in your American and Florida family. Our Clinic is happy to help you with all of your Healthcare problems and needs, and we again look forward to providing the highest quality of Florida Healthcare to our many winter residence, visitors and Canadian friends. We know that you can choose other areas in the United States to weather the cold northern winters. But St. Petersburg and the Tampa Bay know you best and our arms are open to you. We hope that you stay hail and hearty while in Florida and America, but if you must come see us.